One of the neat things about New York is our train system. It may not be the cleanest or the most modern but there is a lot of history to be found. In Brooklyn we have the New York Transit Museum where you can personally walk through trains from the 1930's to the 1960's. It's magical, I will not lie. I went once with my family for Mother's Day in 2013 which you can see more of HERE. Even though I have been to the museum I haven't taken the holiday vintage train ride. This year we dared to go as the little one is a bit older now and can walk through the city easily. For the cost of a normal train ride on every Sunday from November 25th to December 30th the Transit Museum lends out one of its beauties to run a line from Queens into Manhattan. They even have a specific time schedule to tell you when they will be there which is priceless especially when traveling with three small children. We parked our car near the train station, took a train to Queens Plaza and impatiently waited for our vintage train to come pick us up. 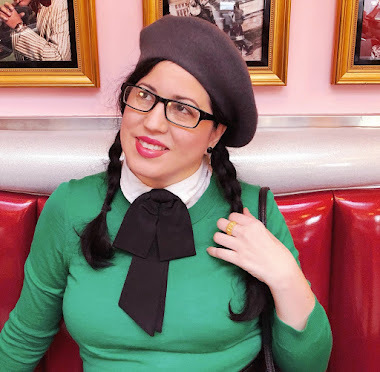 There were a few people dressed in what I would call "vintage inspiration" which made me regret for two seconds that I didn't dress up. I'm glad I didn't though because in my regular clothing I am able to get around better and not worry about my dress getting dirty or other such things. The day was for the kids and I am so thankful we had the opportunity to do this together. Its a big deal for us because my husband normally works everyday but that Sunday he was off so we took advantage of it, packed some snacks and water bottles in our book bag, grabbed our trusty Metrocard, and away we went. I loved it. It rode a little bumpier than the modern trains do but it ran well. Each train car was open so you can walk through all of the train cars which is what people without small children did. We rode in a train that seemed to be made up of different cars. We only saw two but sitting in the seat that people sat in over 80 years was really cool. My children enjoyed it but when we recounted what the favorite part of day was (because there is more to be shared of our adventure in tomorrow's post), this was by far my favorite. We rode from Queens Plaza to the last stop and then took it back to Rockefeller Center. Taking the vintage train was a very special event that I most definitely want to do again next year. This time I hope to get dressed up and perhaps attend their after party? 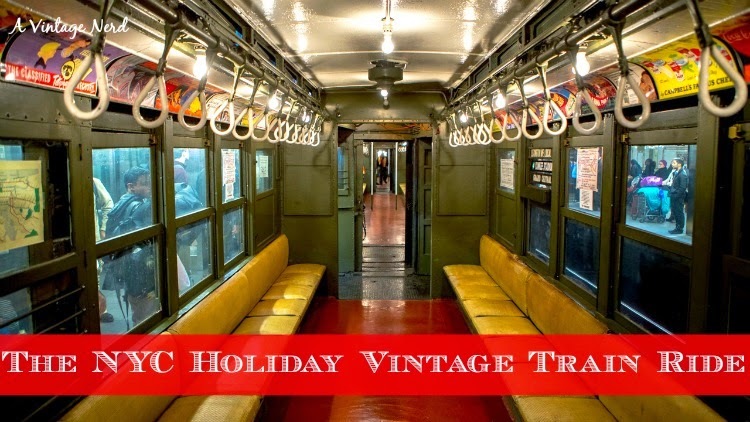 If you are ever in New York for the holidays, look up the vintage train ride HERE. You won't regret it! This sounds amazingly fun. I saw some photos from the dance party in the subway station that looked really cool, but this sounds like a nice activity as well, and a lot of fun for the kids. This looks and sounds amazing! I love the old signage! This is great! Your little ones are so cute posing for the camera all bundled up:) It's such a special event to attend and sorry I didn't catch you this year. Your photographs shot inside the train are great! Wasn't it also interesting to see the older electric bulbs strung from the ceiling? I wonder if they have a large stockpile of these, since I believe they don't make them anymore. I can see how this event is right up your alley too:) I hope I can go again next year. I didn't get too much time in the museum. Thanks for sharing your experiences D! This sounds so fun! I hope I can end up in NYC during December time, so I can attend.